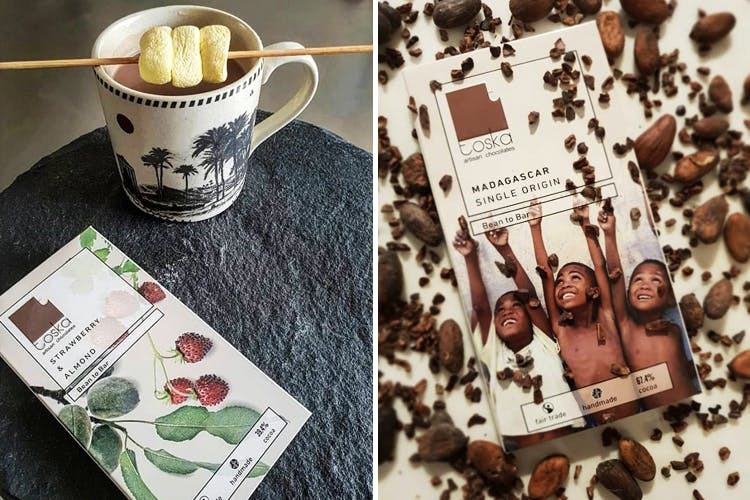 Ahmedabad-based chocolate brand, Toska, is one of the few brands in the country following a bean-to-bar philosophy. This ethical venture helps farmers financially so they’re growing only premium quality cocoa - and it goes unadulterated into all their bars. Their flavours also use fresh fruits, saffron, nuts and more authentic ingredients to celebrate that rich, gooey feeling that comes from biting into a sinful dessert. Unlike other chocolate brands, Toska doesn’t use sugar that takes away from cocoa’s own peculiar aroma. These Made-In-India bars also use some really unconventional ingredients like ginger, cardamom, rose petals, saffron, biscuits and berries, making these a rather sweet proposition on a dull day (or even to celebrate a happy one). The brand also has a good-natured chocolate snob who quit his father’s business to deep dive into the sweet world of chocolates. Ishan decided that everyday chocolates deserved a revolution, and bean-to-bar came around. One bite into these and you’ll realise what a difference the bean itself can make—and hey, you’re getting unadulterated joy and supporting fair trade for cocoa farmers. So, if you’ve got a dark chocolate or single origin choco fan in your life, they probably deserve this indulgence (or, in fact, you do too). They also have chocolate jars, but you can only pick between three of those as of now—we'd love if there were more options for those.